And, success is online marketing is one of the reasons Belize's overnight tourism numbers continue to look up. The latest figures released by the BTB show an amazing increase in April, with 24.2% more overnight arrivals when compared to 2016. June also showed strong growth with a 10% increase over last year. That averages out to a strong 7.8% increase over the second quarter of 2017. And while June saw more overnight visitors than any other June on record - as good as all that was for overnight tourism, it was equally bad, or worse for cruise tourism. June saw only 13 cruise calls, and just over 47,000 cruise passengers - which is down 28% from last year. And so while second quarter arrivals were down, there has been an overall increase of 3.1% in total cruise passenger arrivals so far in 2017. Belize continues to draw tourists by land and sea to visit the Jewel, though not in record numbers as before. For the first half of the year, more than two hundred and thirty thousand travelers touched down in Belize, a rise of nearly eight percent overall, boosted by a record thirty-seven thousand-plus count of tourists in June. 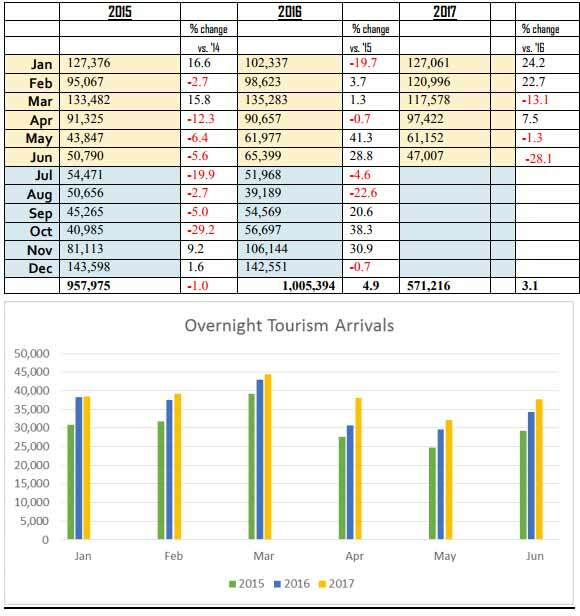 With figures for overall overnight arrivals in June rivaling figures in January, the Belize Tourism Board suggests that the “high season” months for tourism may be expanding. Meanwhile, cruise tourism has grown more modestly at three point one percent for the first half of 2017 although figures for May and June show decline compared to last year. For the first time, arrivals for 2017 include visitors from both the seaports in Belize City as well as arrivals to Harvest Caye in the south.